As sweet as cinnamon: 'Out of the Box' is finished. Vicki and I have had so much fun doing this BOM. quilt hanging proudly in my front entrance. What is your your favorite block on your quilt??? The instructions to finish it are ready for you to puchase. use them on anything like a bag or folder or cushion. 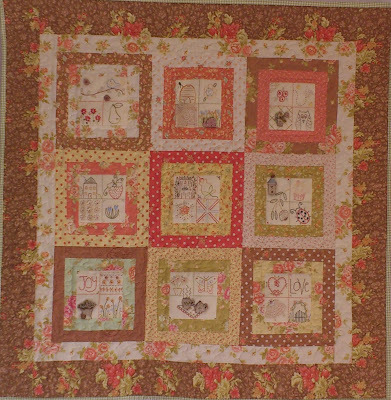 It looks fabulous and I just love the little details Vicki added to the finished quilt. I would love you to show your quilt in our Flckr group. as of the 1st of October for $6.00Aus. giveaway's and also with links to great places to shop as well. Guest shop news too. So sign up today top right hand corner. so your private information stays that way...Private. I just love how the first borders flowers seem to run into the outside one, just beautiful girls. Your finished quilt is just gorgeous. Vicki's is so different but I like them both. It is GORGEOUS Dawn!!! Thank you so much! And woohoo, a newsletter - I'm signing up! This is so lovely Dawn your work is always nice. You lady's are far to clever for me, I am still a beginner and my projects don't turn out as neat as yours yet. As Allie and Maria have already said Dawn, this is Gorgeous!!!!! 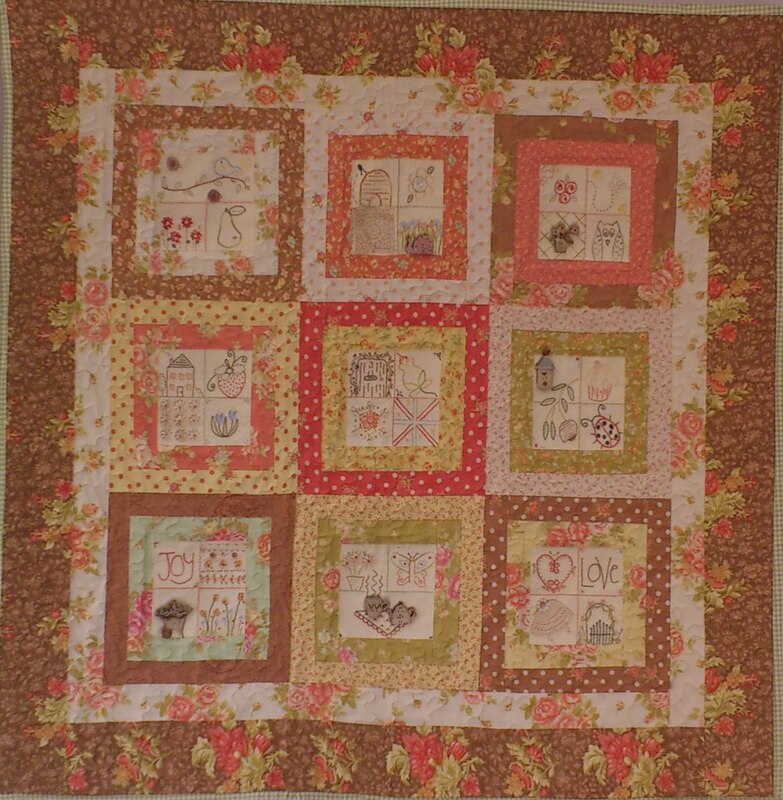 Love Love the quilt, each block is adorable. Lots of work went into this quilt. Oh Dawn - it's a true beauty! I love it! You're so talented girl! And, it's so fun to follow you along and watch your creative juices flow! Hugs!!! That's a wonderful quilt...all the blocks are equally lovely! Such a sweet quilt and so pretty. Bet it looks a treat in your entryway. It's gorgeous Dawn, I don't know what to do with mine because I've done both yours and Vicki's blocks! Beautiful quilt!!!! I love the colors the stitchery!!GORGEOUS!!!! Such a beautiful quilt Dawn,you did a great job!! Oh it's GAWJUS Dawnie .... love all that Fig Tree Fabricky goodness ;o)!! Your quilt is lovely. I have all of my blocks done and will download the directions to complete it. I may have to purchase a little fabric, we'll see. Thanks so much for sharing this fabulous BOM with us. Hi! Greetings from Finland! The quilt looks lovely! I love the colors! Thank you for your lovely blog!!! Absolutely love your quilt! I love them all!